An airport has reopened after a multi-million pound project to improve its runways. 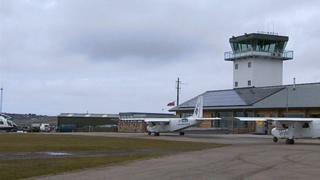 Tarmac has been laid on two runways at Land's End Airport, in Cornwall, which has been closed since 4 July. It was due to reopen on 21 July but was delayed because of resurfacing problems. The airport has seen severe disruption over the last two winters because wet weather affected its grass runways. It was closed to flights for three months in the winter of 2012/13 when the airfield became waterlogged. Skybus flights to the Isles of Scilly have been flying from Newquay since the airport was closed. The Isles of Scilly Steamship Company is the sole provider of commercial flights to the islands. In June, it said about £1.3m from the European Regional Development Fund had been confirmed for the £2.6m project.